Do you have a true testimonial about what it was like for you to read The Book of Beings? 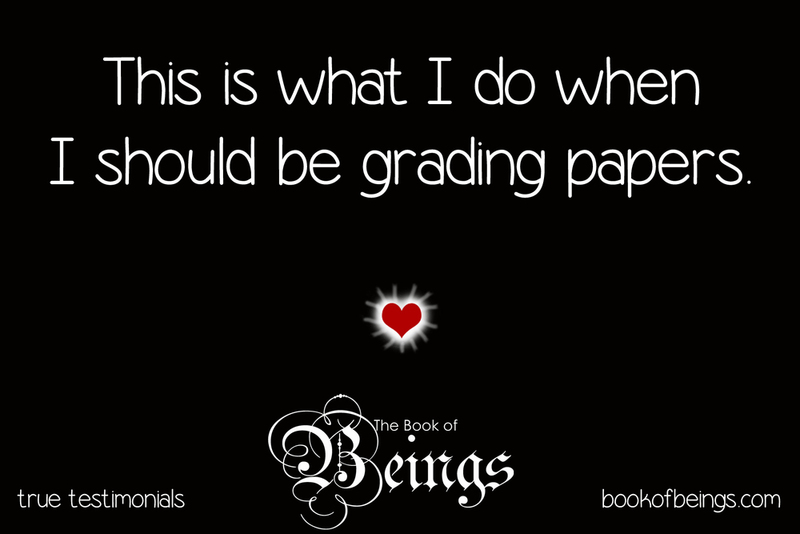 Send it to us at bookofbeings@gmail.com. I spent most of the night reading. I have to give myself a specific amount of time to read it, otherwise I would read all day. This book is making me do bad things, like ignore my kids. My husband is yelling at our daughter. She's supposed to be working on college applications, but she won't stop reading your book. This is what I do when I should be grading papers. I'm reading while I'm brushing my teeth, waiting for my son at pick-up, while I'm drying my hair--amazing how much one can read! This is my best friend. It's the only personal life I have.